Spider-Man: Into the Spider-Verse 4K Blu-Ray Available Now | Nerd Much? 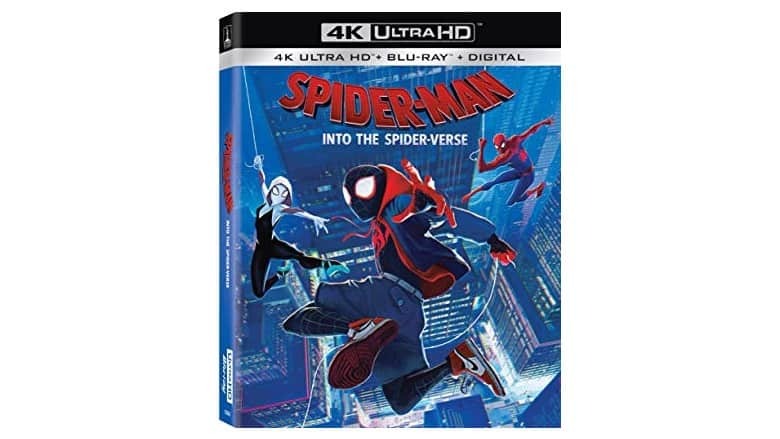 Spider-Man: Into the Spider-verse is in our collective opinion, the best animated movie to come out of 2018, and now you can bring it home in 4K Ultra HD and Blu-Ray. As we noted in our Into the Spider-verse review, it does a great job of translating the comic book source material into an animated film that not only appeals to kids but satisfies adults as well. And it introduces a complex storyline packed with many new characters to an audience that may not be familiar with it all, and it does so without making the film feel rushed or filled with too many characters or plotlines – unlike so many other superhero movies that have tried and failed to make a superhero team-up movie with characters that the average moviegoer wouldn’t know. It’s Into the Spider-verse’s art style that’s most unique, with vibrant colors that pop, often featuring a CYMK color scheme. The animation was also rendered in a slightly lower framerate than most films which created almost a sort of stop-motion feel like you’re rapidly flipping through comic book pages. This along with text boxes, the occasionally visible onomatopoeia, outlines on characters and objects, and Ben-Day dots on certain surfaces create the feeling that the very essence of a comic book itself has been brought to life and you’re watching it unfold right in front of you. The soundtrack is brilliant, the voice cast is phenomenal, and the humor and tone of the film are also on point. It strikes that perfect balance between humorous and dramatic. The characters are three-dimensional and believable, and the story is well-paced, introducing characters and plot points in a timely manner without any rushing or lagging, and it even pulls a few surprises on you. Spider-Man: Into the Spider-verse will draw you in with its interesting concept and unique art style. You will get to know these characters and grow to care about them. It will make you feel real emotions and dazzle you with its amazing soundtrack. You can buy it now on Amazon, at Target, and other retailers. We also included it on our list of Easter gift ideas for kids.